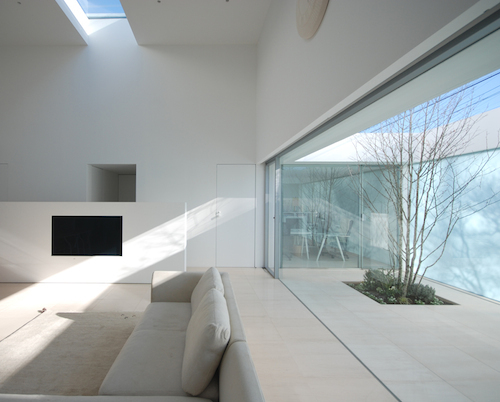 Shinichi Ogawa & Associates have designed a serenely private home with a high-ceilinged central living room based on a courtyard, in Tochigi, Japan. 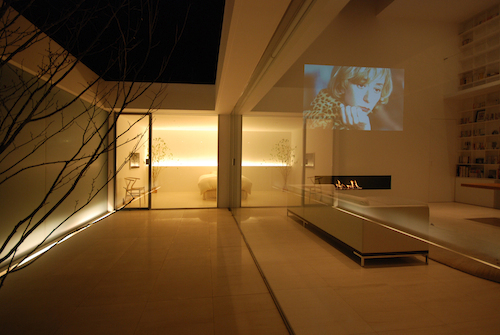 Semi-opaque glass diffuses light into a courtyard that brings light to the tall central living room. 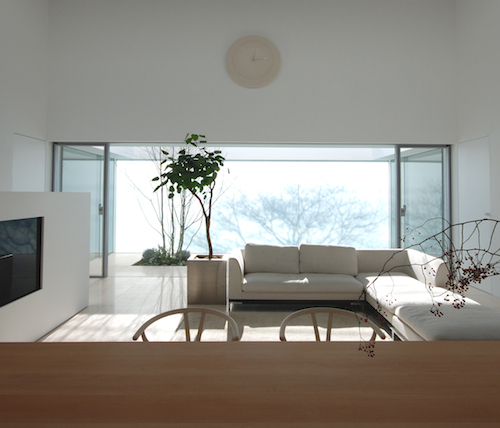 The taller central white cube houses a spacious double-height living room, while normal height is reserved for surrounding courtyards and remaining rooms. 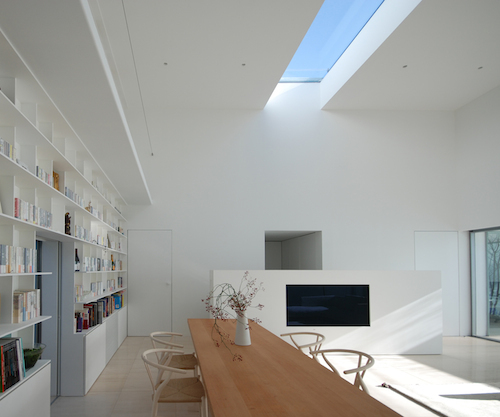 The double-height ceilings in this great room at the centre of the house makes a grand space for entertaining. 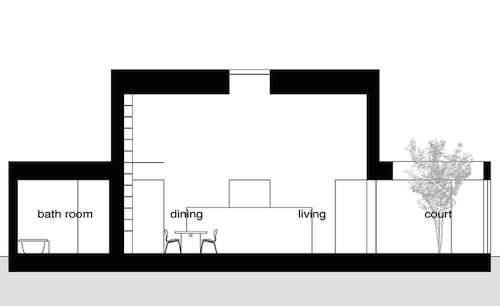 The slice shows the internal plan of the smaller rooms encircling a central cube. 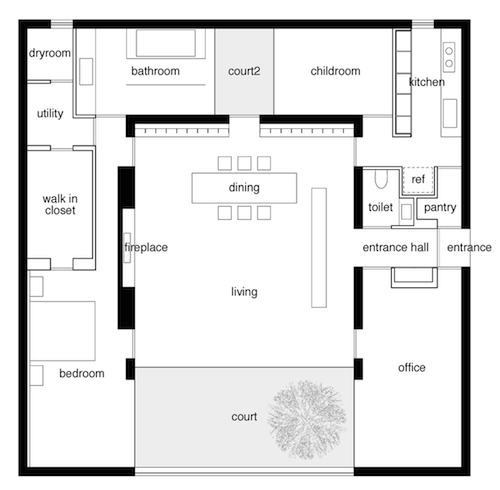 It’s possible to access to all of the rooms encircling the central living room. Very low-profile doors exiting the main room to the kitchen and office contrast with the clearly announced entrance alcove. The master bedroom suite can be accessed through the courtyard, or through a similarly understated door from the living room. 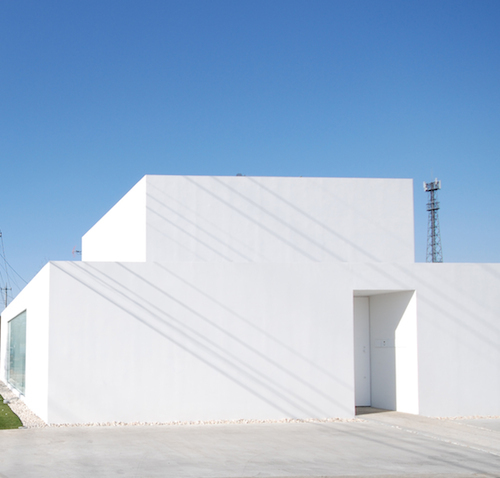 Courtyards at both sides bring daylight into each room, despite the apparently windowless exterior. 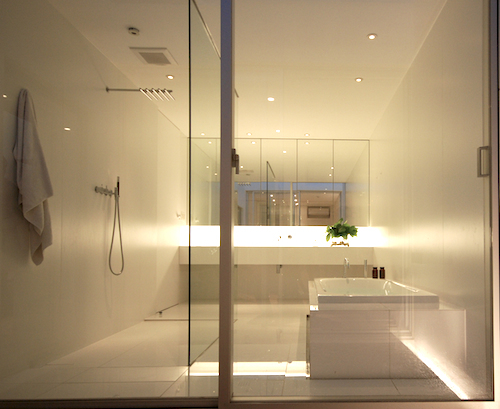 Opening off a second smaller courtyard at the back of the house, the bathroom enjoys a blissfully open space. Full-sized floor-to-ceiling glazed doors that can be fully opened to the outdoor courtyard are only half this room’s extraordinary height. 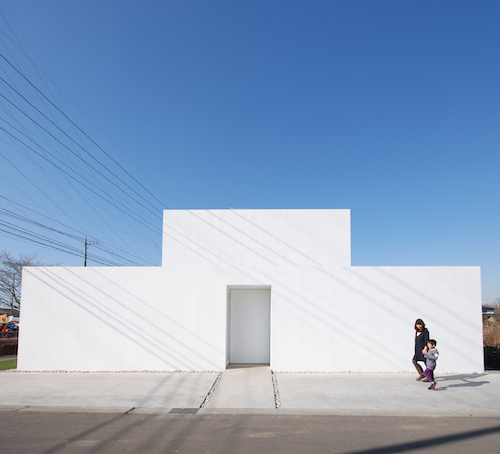 A very intriguing design – for a client who loves to read, and desired a compact yet grand live-work space in downtown Tochigi – that was totally private. This entry was posted on Thursday, November 29th, 2018 by Susan Kraemer and is filed under Architecture. You can follow any responses to this entry through the RSS 2.0 feed. You can leave a comment.